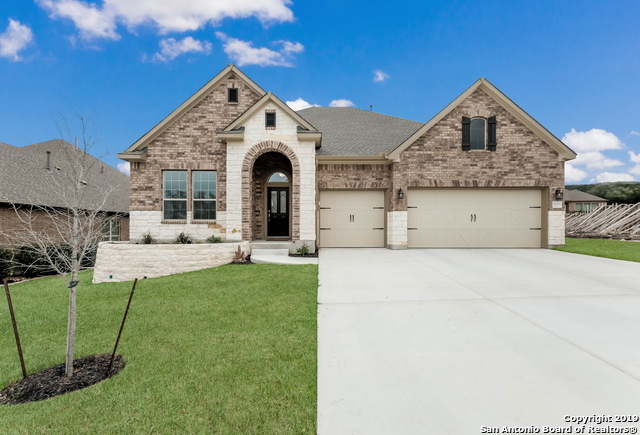 All Triana homes currently listed for sale in Helotes as of 04/20/2019 are shown below. You can change the search criteria at any time by pressing the 'Change Search' button below. "*UNDER CONSTRUCTION* IT'S ALL ABOUT THE KITCHEN in this phenomenal single-story home with Texas-sized bonus room upstairs! Seat 5 comfortably at the 11' kitchen island which looks directly into the family room and adjacent dining area. Never wonder again where you'll put all the pots and pans, as this kitchen has room for everything! This stunning home offers offset ceramic tile flooring, granite in the kitchen and all baths, gorgeous 42 custom cabinets with pewter glaze, & spectacular walk-in"
"Stunning 1 story luxury home in Triana. Enjoy all the upgrades you could dream of! SS Viking appliances, gorgeous granite, wall mounted retractable pot filler faucet, hardwood & travertine flooring thru-out. 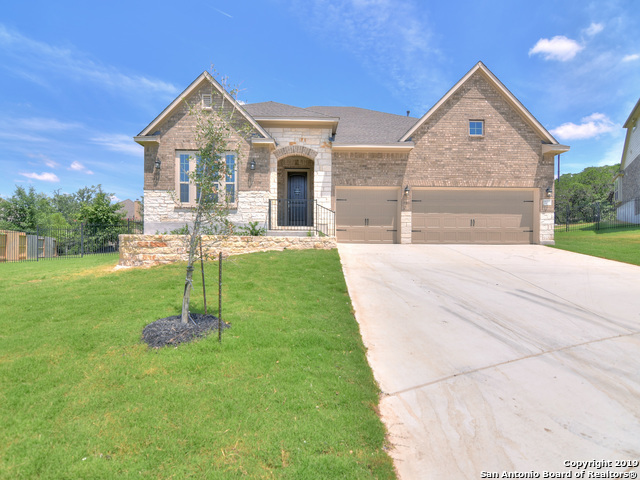 Over-sized family/living room, fabulous outdoor kitchen w/fireplace & seating area overlooking beautiful Texas Hill Country, Immensely landscaped back yard w/ tons of trees/bushes & perennial blooming flowers. Trees behind fence were also planted for privacy and bloom at different times of "
"YOU'LL NEVER MOVE AGAIN once you experience this spectacular single story home! Supersized bedrooms are incredible with access to their own bathroom and a lovely in-law suite is perfect for visiting family and friends. A large enclosed study makes a great game room or office. Have friends over to BBQ on your large covered porch, and when the party's over, retire to the secluded owner's retreat w/spa-like Super Shower. Final opportunity to own a NEW David Weekley home in Triana!" "6 Months New, Ready for You...still smells new!! This David Weekley one level will not disappoint. Loaded with upgrades. Too many too list. Call us for an Additional Features Sheet today. Owners Relocating. Ask us why this is one of the best values in Helotes! If your new to Triana, come a discover a place where community, still exists. Everyone has a green belt lot, schools, pool, and great neighbors. 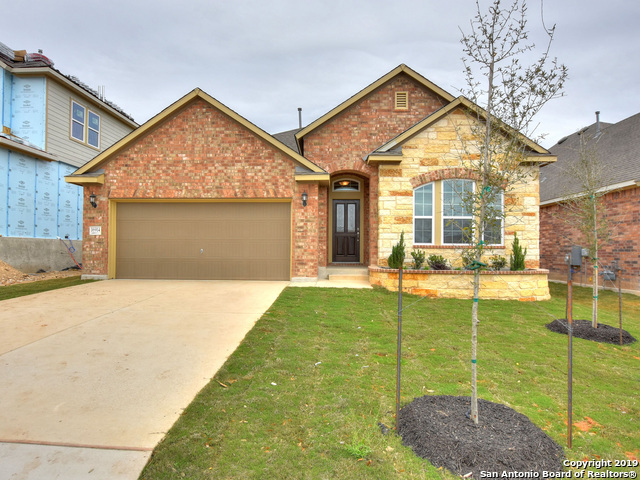 Helotes is another wonderful community of its own with shopping and a small-town atmosp"
"IMMACULATE ON A GREENBELT WITH AN EXTENDED COVERED PATIO COMPLETE WITH OUTDOOR KITCHEN, 4 BEDROOMS AND FORMAL STUDY. TILE FLOORING THROUGHOUT; CHEF'S DELIGHT KITCHEN W/SOLID SURFACE COUNTERS, GAS COOKING,DOUBLE OVENS, & CUSTOM CABINETS, OVERLOOKING SPACIOUS FAMILY ROOM! MASTER SUITE BOASTS SPACIOUS WALK IN SHOWER WITH VIEW OF PRIVATE TREED YARD. 3 FULL BATHROOMS, 3 CAR GARAGE, HIGH CEILINGS H20 SOFTNER, REVERSE OSMOSIS,OUTDOOR KITCHEN BOASTS: SINK, & WINE FRIDGE GAS GRILL WITH ROTISSERIE! FEE"
"New To Market 1 Story Beauty Resting On a Large Corner Lot In Cul-De-Sac & Greenbelt*Mature Trees & Landscaping*Brick & Stone Exterior*Huge Custom Covered Patio W/ Etched Stained Concrete & Fireplace*Additional Study*Formal Dining*Open Kitchen W/ Granite Topped Counters & Island*Tile Flooring*Large Master Shower W/ Separate Garden Tub & Dual Vanity*Great Schools*Amazing Community W/ Neighborhood Pool, Park, Pavilion, & MORE!!! A MUST see!!! Call Today For Your Private Showing!!!" "GORGEOUS 1-STORY is the perfect way to downsize! Explore culinary delights in your gourmet kitchen. Your Owner's Retreat offers spacious grandeur w/a bay window that balances privacy and natural light. The master bath features a Super Shower and remarkable walk-in closet. The children's game room is located between secondary bedrooms. Bonus features include 10' ceilings, large covered patio, beautiful kitchen w/gas cooktop and plentiful storage, & large open study/formal living room. Welcome Hom"